Bernie Sanders, 74, is a United States senator from Vermont. A long-time political independent, Sanders joined the Democratic Party in 2015. Sanders graduated from the University of Chicago with a BA in political science. As a young man, he was active in the civil rights movement, working as a student organizer for the Congress of Racial Equality and the Student Nonviolent Coordinating Committee. He participated in Chicago’s first civil rights sit-in and attended the 1963 March on Washington. He was denied conscientious objector status during the Vietnam War, but ultimately his age kept him from being drafted. Sanders ran unsuccessfully for Governor in Vermont in 1972 as a member of the Liberty Union Party (an offshoot of the anti-war movement). In 1980, running as an independent, he was elected mayor of Burlington, Vermont, and he was reelected in 1983, 1985 and 1987. In 1990 he was elected to the House of Representatives, where he served until his election as a senator in 2006. He was reelected to the Senate in 2012. In the House, Sanders chaired the Congressional Progressive Caucus (which he co-founded) for eight years. A 2011 poll rated Sanders as the third-most popular senator in the country, with an approval rating of 67%. His voting record has been rated 100% by the NAACP and the National Hispanic Leadership Agenda. In 2013-14, he chaired the Senate Committee on Veterans’ Affairs. In 2015, he became the ranking minority member of the Senate Budget Committee. Sanders, a self-described democratic socialist, holds progressive political views that echo those of Lyndon Johnson and Franklin Roosevelt. In addition to his positions on the next chapter’s six focus issues described below, Sanders has been a critic of international trade agreements, has advocated expansion of Social Security benefits, has favored parental leave, has advocated comprehensive financial reforms, has opposed the U.S. incursion in Iraq, has supported LGBT rights and has advocated criminal justice reforms. At the Miami debate in March, Sanders stated his opposition to deportation of children and immigrants who have no criminal records. Bernie Sanders voted for the Affordable Care Act, but he believes that it does not go far enough to provide universal, high-quality health care in a cost-effective way. He supports moving toward a single-payer “Medicare-for-all” system that would cover doctors’ visits, hospital stays, long-term and hospice care, vision, dental care, mental health and prescription drugs. The plan would be funded by a new 2.2% income tax on all Americans and a 6.2% levy on employers, but most families and businesses would pay less for health care than they currently pay because his plan would eliminate private insurance premiums, co-pays and deductibles. Wealthier Americans, however, would pay higher income tax rates. Do you support the nuclear agreement with Iran? Last year, the United States, together with five other nations, announced that a deal had been reached with Iran to limit Iran’s nuclear development program. Under the agreement, known as the Joint Comprehensive Plan of Action, Iran must close certain nuclear facilities, reduce its capacity for enriching uranium, limit its stockpile of low-enriched uranium and end the production of weapons-grade plutonium. On January 16, 2016, the final nuclear deal was implemented after the International Atomic Energy Agency confirmed that Iran was in compliance with its provisions. In return, economic sanctions against Iran were lifted and billions of dollars’ worth of Iranian assets will be unfrozen. On the floor of the Senate in September, Sanders expressed his support for the deal, saying: “It is my firm belief that the test of a great nation with the most powerful military on earth is not how many wars it can engage in, but how it can use our strength and our capabilities to resolve international conflicts in a peaceful way.” He suggested to his colleagues that the negotiated deal should be given the chance to succeed. Do you believe that human activity is largely responsible for climate change and do you favor regulation of emissions? In contrast to their Republican rival, both Hillary Clinton and Bernie Sanders believe that climate change is a real threat. 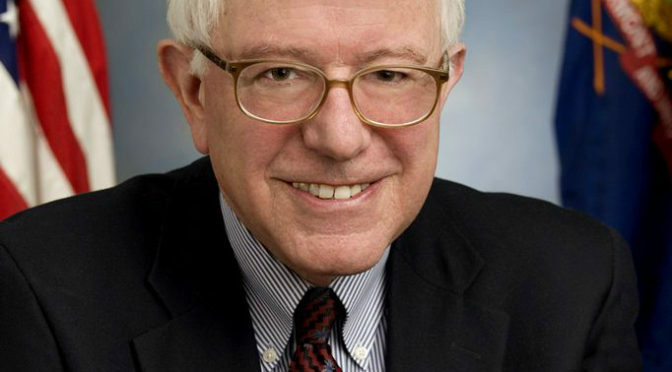 Sanders has called for “transforming our energy system” by increasing energy efficiency and sustainable energy sources. He supports a carbon tax. He supports phasing out natural gas and nuclear energy. He opposes the use of fracking (hydraulic fracturing) technology to extract natural gas. In November 2015, Sanders along with Senators Jeff Merkley and Patrick Leahy introduced the Keep It in the Ground Act, which would prohibit new coal, oil and gas drilling on federally-owned lands and waters. Sanders has said that “climate change is directly related to the growth of terrorism.” Although Politifact has criticized Sanders for calling the relationship “direct,” President Obama, the Department of Defense (DoD) and others have warned of the connection between climate change and the growth of terrorism. Do you support increasing the federal minimum wage? For many years, Sanders has supported a “living wage.” He introduced the Livable Wage Act of 1993 in the House and re-introduced the bill in 1995, 1997, and 1999. In the Senate, Sanders introduced the Minimum Wage Restoration Act in 2001, and he has co-sponsored similar bills since then. In 2013, he proposed a budget amendment to raise the minimum wage to $10.10 per hour. In a recent tweet, Sanders noted: “Increasing the min. wage to $15 an hour would reduce spending on food stamps, public housing and other programs by over $7.6 billion a year.” Politifact rated this claim as “mostly false”; however, they reported that a study by the Economic Policy Institute found “Raising the minimum wage to $10.10 would reduce government expenditures on current income-support programs by $7.6 billion per year — and possibly more.” The overall economic effect of raising the minimum wage to $15 (taking into account possible job losses) has not been studied. Do you support campaign finance reform? Sanders supports legislation to provide public funding for elections. He also favors a Constitutional amendment that would overturn Citizens United, making it clear that “the right to vote and the ability to make campaign contributions and expenditures belong only to real people,” not corporations. The Fair Elections Now Act, supported by Sanders and others, would provide public funding of primary and general election campaigns to candidates who raise enough private money to demonstrate their viability as candidates. Sanders has also supported the DISCLOSE Act, which would establish new disclosure requirements for political contributions to candidates. The Next President: Who is Jill Stein?